Nantiki Resort, a very unique property...rent one, two or three bungalows depending on what size group you have. Great location on West Lagoon Avenue, between the Gulf of Mexico and Little Lagoon with beach access. All Nantiki Resort guest can enjoy our outdoor kidney shaped concrete pool (3ft to 6ft) with lounge chairs, private cabana's with MediaCom wifi and satellite TV, outdoor music, outdoor restroom & shower, white beach sand volley ball court, basket ball goal, grill w/propane tanks, bar counter, shuffle board, swings, hammocks, fire pit and patio furniture, picnic tables, and lounge chairs. Nantiki Resort, St. Thomas is a 3 BR/2 BA bungalow and includes; a full size washer and dryer, sleeps 12 min, 1 sectional sofa, 1 sleeper sofa with 2 pillows, 1 queen bed with 2 pillows, 2 full beds with 4 pillows, 2 twin beds with 2 pillows, 1 set of bunk beds with 2 pillows, free wifi, tv and cable in each room and living room has DVD player. Central heat and air. The kitchen is fully stocked with silverware, dishes, glasses, cups and basic pots, pans and cooking utensils. The dining room is adjacent to deck overlooking the pool. The deck overlooking the pool has a patio table and chairs with umbrella on it and access to down stairs. Guest can park two automobiles in front of St. Thomas and there is additional parking out front at the entrance to Nantiki Resort. Nantiki Resort is a great place to stay for a family vacation, baseball or volleyball tournament. Schedule a visit during an event like the Shrimp Festival, Spring Break and Hangout Festival! Nantiki is great for everyone! Give us a try! We would love to have you stay with us! My wife and I live in Gulf Shores and own 24/7 All Services, LLC a local contracting, plumbing and electrical company that performs many services for the community, residence and guest all over Baldwin County. We love Gulf Shores and it is a beautiful beach area and we wanted to give other people the opportunity to enjoy Gulf Shores. That is why we purchased Nantiki Resort at year end 2014, for families to enjoy a fun filled vacation. With all the amenities onsite, the outdoor space and multiple bungalows, pool, volley ball court, basket ball...it is a great place for families and friends to gather. Enjoy the water and wonderful local area attractions, come back to Nantiki Resort, a place that is private and comfortable, let the kids run about and play, grill and relax. That is what we want for our guest. Since, last season we replaced all the flooring in all the bungalows and painted. We also, resurfaced the pool! We plan to do much more! Please come by anytime and look at our resort. We would love for you to make a reservation anytime of the year. Call me personally at 251-609-1126, my name is Ray Mishali. Nantiki Resort has the opportunity to rent 1, 2 or all 3 bungalows. The location is on West Beach in Gulf Shores. Great family area with the beach to the south and lagoon to the north of the property. Private and close to local attractions, restaurants and shopping. There are front and back decks overlooking the property. You can see all kinds of activity from volley ball play, basket ball play, swimming in the pool...you can just see someone relaxing in a hammock, someone grilling, kids and adults playing shuffle board after a long day at the beach. Outdoor music, wifi, TV, outdoor shower and bathroom. Full size bathrooms, one upstairs and one downstairs in master bedroom. 1.5 Miles from Gulf Shores public beach entrance where the Hang Out Festival, Shrimp Festival and other events take place. Across the street from the Gulf of Mexico and Little Lagoon. Full size beach volley ball court and basket ball goal onsite. Couldn't agree with Brandy's review. Pretty sad when this was suppose to be a wonderful family get together from all over! You have to choose a star to post a review...is there a minus 50 available?! The layout of the three houses, with the pool, is very nice. The housecleaning staff had our house "Antigua" clean for us upon our arrival. Joe, the onsite manager, was great and always willing and able to address issues, and help with getting to and from the beach. * Oven light did not work. * Only 1 out of 3 TVs worked. * One TV remote had no batteries. * Upstairs bedroom ceiling fan had NO BLADES on the fan. * Light over our house's outside deck did not work. We did contact Joe to fix our wi-fi, that was not working as well. He had to contact the provider and obtain a replacement wi-fi unit from them. For the price paid for the week, the condition of the house should have been much better. Even though Joe was very kind in hauling our stuff to and from the beach, the walk is inconvenient, including having to cross a highway, which is difficult with little children. We felt like the advertising led us to believe that the walk was much easier, and more convenient than it actually was. Overall, we had a very good time during the week. The pool was clean and very nice. If they invest a little time and money to bring this house up to date with repairs, and a little paint, it would have been much easier to take the walk back and forth, to/from the beach. I'm afraid we would not choose to return, based on the cost and the overall condition of the property. We appreciate all of our guest and their reviews. We understand the importance of improving our properties and making each guest stay as comfortable as possible. Oven vent is scheduled to be replaced. All the TV's do work. Guest was not familiar with the operations. The remote without batteries was an extra remote that did not belong to anything in the unit. And, has since been removed. Living room lamp needed a bulb. Please just ask onsite manager and he will replace with new bulb. Extra lamps in closet have since been put into the owner closet. Ceiling fan had two missing blades and onsite manager put two new blades on ceiling fan. Light outside was replaced. Even though that particular light did not work, there was plenty of lighting at the house outside. We have Media Com cable and internet at the property. And, there are times when the provided must be called. We called and immediately got the internet up and running as quickly as possible for guest. In regards to our prices, our property is unique. Three houses, pool, volley ball court, grilling, bikes, shuffle board, ice machine, and so much more. The price includes the extra amenity of having Joe onsite, too. He sets up beach tents and chairs, ice down coolers, takes items to and from beach, he is available for you 24/7 during your stay. If you needed anything from the store or a special errand, he would do it for you. Our access to the beach is across the street. Again, Joe is there to assist and make this short walk across the street as easy as possible for you. We make minor repairs and upkeep to the houses as needed. In the winter we will typically do more improvements to the properties. Last year we installed all new flooring. This year we will do more with paint, bedding and decor. Overall, we do our best to ensure that all of our guest are comfortable and are having an enjoyable stay Nantiki Resort. Even though this guest had some minor concerns, the family vacation was fun and enjoyable. I rented this property during the Christmas holiday for my family. We really enjoyed the location of the house. During our stay I learned that the house is located in an older part of Gulf Shores. And, the house definitely speaks its age. We also learned that during the summer months the resort is rented to fraternities, which could have something to do with the condition of the house. We really liked the idea behind the setup of Nantiki Resort. There was a lot to do to keep kids busy, such as the pool, free bike rentals and shuffle board. But, the property itself needs a little work. I have rented numerous properties over the years, and I have to say, this was one of the most disappointing places I have ever stayed. There were several issues with the house we rented. The light over the dining room table was missing. There were open and exposed wires hanging from the ceiling. The house was extremely dirty. I was expecting the house to be way cleaner. My sister used one of the outlets in the bedroom upstairs to blow dry her hair and the outlet sparked. The owner assured me that these items would be addressed before the property was rented to another visitor. I realize we visited during the off season but I expected the property and the house to look like what was advertised in the photos on VRBO and the Nantiki Resort's website. This was not at all the case. I was truly surprised by the condition of the house. The owners of the property did refund the cleaning fee and the lodging tax after I addressed by concerns with them. The fact is, we never learned of the guest dissatisfaction until after they left Nantiki Resort. In addition, we have an onsite property manager there daily that would have assisted them immediately had they even asked. If a guest should ever be unhappy about anything...they must call and let us know so we have an opportunity to remedy their concerns immediately. We did not have that opportunity. Within the last year we have been completely booked and all guest have been very happy. In fact, we have guest calling from last year renting again this year. We have also begun what was originally planned for improvements during the off season of January 2016. For each house, we are removing the old flooring throughout and installing all new flooring, painting each house interior and exterior with a beach pallet of color and many more things. Nantiki Resort is a fabulous resort for all people and is advertised correctly. The Nantiki Resort is the perfect place to stay with a large or small group. We slept 8 people comfortably in one house for a few nights until others arrived. Then we had all three houses for the rest of the week. The pool was perfect, with outside tvs, tiki huts, suffle board and other games, everyone was happy. Joe was so helpful and always there to take us to the beach or help us if we needed anything. By the end of the week we had 20 people and i heard more than once "we will be back". Loved every minute! We couldn't have asked for a better vacation! We rented all three homes for 3 nights. Joe was absolutely amazing! The whole set up was really cool, common areas that were fun for everyone. 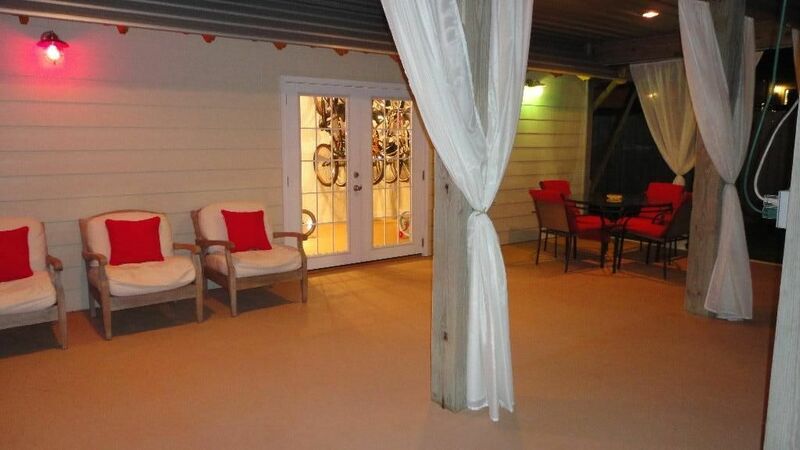 Walking distance to the beach; right next door to a bar/restaurant and store! Will definitely be back! We had an amazing stay at the Nantiki, August 2015!! A large group of friends rented all 3 houses for 4 days and could not have been happier with the set up. For the price you could not go wrong with booking this resort. The owners were amazing during the entire booking/planning of the trip!! Always speedy to answer all questions and with 24 people there were lots of questions and concerns!! There was plenty of room for our group of 24! Joe the property manager went well out of his way to accommodate our needs. The tent and chairs already at the beach and the golf cart service to carry all the coolers and beach bags was awesome!! He even stopped at the store each day to fill up the coolers! You will not be sorry if you plan a trip and stay here! Nantiki Resort located on West Beach in Gulf Shores, AL is a great place for families to enjoy a fun filled vacation! The West Beach area of Gulf Shores is filled with beach cottages and has fewer high rise condos. Walk across the street to the white sand beach or lagoon. Relax by the pool, enjoy private cabana with TV & cable with free Wifi, play volley ball or shuffle board. Grills, firepit, hammocks, lounge chairs and patio tables and chairs onsite. Simple things to enjoy...get a net, sand bucket and shovel walk along the beach collecting sea shells at sunset or sunrise. Go to the Little Lagoon pass bridge to blue crab fish at night is so much fun! Cast fishing on the beach, Gulf Shores Pier fishing, charter fishing...so many options for a fishing day. We have so much to offer in our area. Please check out the links below to find out what festivals and events are taking place during your visit to Gulf Shores. Gulf Coast Chamber of Commerce. No matter how long your stay take advantage of the fun; go to Waterville USA, The Track, Lulu's, Pink Pony Pub, Sail Wild Hearts, Dolphin Cruises, Golf, Wave Runner Rentals, Charter Fishing, Gulf State Pier Fishing, Shopping, Helicopter Tours, Parasailing, Restaurants and Bars. Rates are subject to change at anytime. Reservations must be confirmed by owner. Cancellations have a non-refundable $150.00 processing fee when reservation / rental agreement is cancelled 60 days prior to check in date. Please contact Ray at 251-609-1126 or 251-424-7241 regarding rates. Inquiries may also be sent to azaleasproperties@gmail.com. Thank you for contacting Nantiki Resort!